Senior forward Joey Calistri takes aim for a shot. 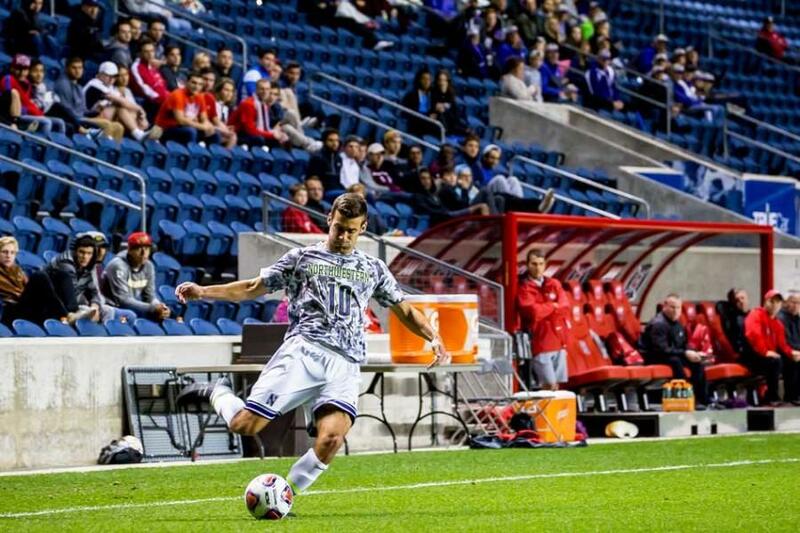 Calistri’s goal against DePaul moved him into second place in NU’s all-time goals scored list. An own goal late in Wednesday’s match left the Demons feeling blue. Northwestern (5-4-1, 2-2-0 Big Ten) edged DePaul (1-10-0, 0-2-0 Big East) 2-1, thanks to a strong first-half performance and a late own goal by the Blue Demons. The own goal, which came in the 86th minute off a long throw-in that bounced around the box, left the home crowd stunned. NU came into the game fresh off a victory over highly ranked Maryland, but a victory against the Blue Demons was far from assured. Coach Tim Lenahan believes that Wish Field, home of the Blue Demons, is one of the toughest places to play in the country, regardless of the Blue Demons’ poor record. From the start of the game the Cats were able to have their way, keeping possession in the attacking third. The high level of pressure greatly limited DePaul’s ability to consistently move the ball up the field, and often forced the Blue Demons to attempt unsuccessful long passes. Winning the time of possession battle translated into a lead in the 19th minute, when NU senior forward Joey Calistri connected for his third goal of the season. Calistri’s goal not only gave the Cats an early lead, but was the 30th of his career, placing him tied for second on NU’s all-time scoring list. DePaul made major second half adjustments, pressuring the Cats the entire length of the field. NU seemed to have abandoned its earlier tenacity, and the Cats were forced to rely on the stellar play of senior goalkeeper Zak Allen. His five saves all proved key, especially with such a narrow margin of victory. The Blue Demons were able to level in the 57th minute on the only shot that Allen was unable to reach all day. It was from DePaul defender Jalen Harvey from seven yards out. This echoes Lenahan’s season-long insistence that NU is not adequately defending set pieces, and needs to fix this to put a complete game together. DePaul’s goal seemed to waken the Cats from their lull, and prompted a return to their first-half form. “We were doing what we wanted in the run up to the own goal, the ball was consistently in the attacking third,” said Lenahan. This was the first of two consecutive non-conference games for the Cats, who host Southern Illinois Saturday at 6 p.m.
“We can enjoy this one for four or five hours, then it’s on to the next,” Lenahan said.